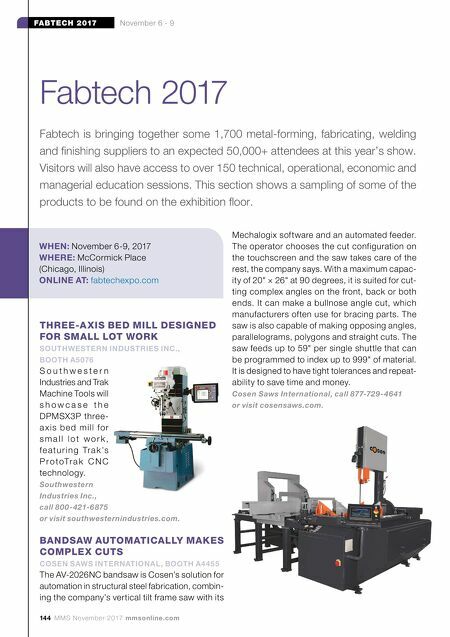 144 MMS November 2017 mmsonline.com FABTECH 2017 November 6 - 9 WHEN: November 6-9, 2017 WHERE: McCormick Place (Chicago, Illinois) ONLINE AT: fabtechexpo.com Fabtech 2017 Fabtech is bringing together some 1,700 metal-forming, fabricating, welding and finishing suppliers to an expected 50,000+ attendees at this year's show. Visitors will also have access to over 150 technical, operational, economic and managerial education sessions. This section shows a sampling of some of the products to be found on the exhibition floor. THREE-A XIS BED MILL DESIGNED FOR SMALL LOT WORK SOUTHWESTERN INDUSTRIES INC., BOOTH A5076 S o u t h w e s t e r n Industries and Trak Machine Tools will s h o w c a s e t h e DPMSX3P three- a x i s b e d m i l l fo r s m a l l l o t w o r k , f e a t u r i n g Tr a k 's P r o t oTr a k C N C technology. 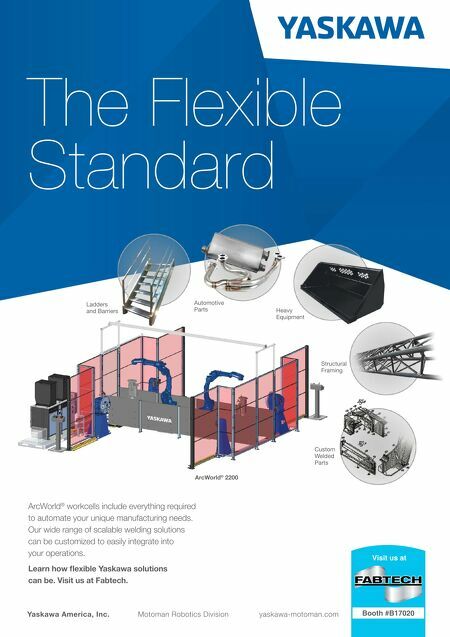 Southwestern Industries Inc., call 800-421-6875 or visit southwesternindustries.com. BANDSAW AUTOMATICALLY MAKES COMPLEX CUTS COSEN SAWS INTERNATIONAL, BOOTH A4455 The AV-2026NC bandsaw is Cosen's solution for automation in structural steel fabrication, combin- ing the company's vertical tilt frame saw with its Mechalogix software and an automated feeder. The operator chooses the cut configuration on the touchscreen and the saw takes care of the rest, the company says. With a maximum capac- ity of 20" × 26" at 90 degrees, it is suited for cut- ting complex angles on the front, back or both ends. It can make a bullnose angle cut, which manufacturers often use for bracing parts. The saw is also capable of making opposing angles, parallelograms, polygons and straight cuts. The saw feeds up to 59" per single shuttle that can be programmed to index up to 999" of material. It is designed to have tight tolerances and repeat- ability to save time and money. Cosen Saws International, call 877-729-4641 or visit cosensaws.com.